After a winter spent looking rather drab the Goldfinches are starting to show a bit of yellow coming in. These two which I spotted last week were the most yellow of any that I have seen so far. Spring may be coming even though it has been colder than normal. ...I love how they fly! Very nice, Pat. These are such beautiful birds and I'm sure a harbinger of warmer days to come! 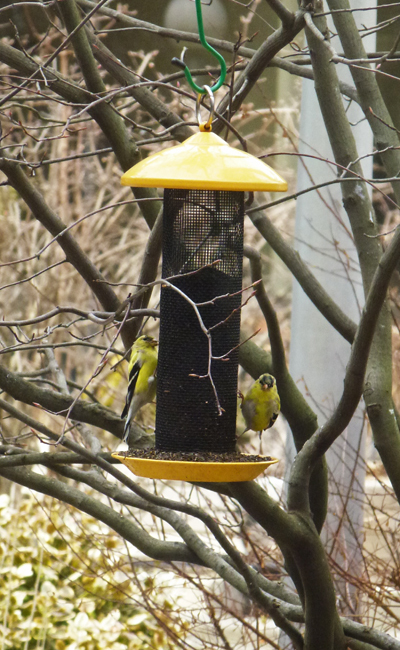 Hello, the goldfinches are pretty pops of yellow color. They are getting there summer colors now. Very pretty. Thank you for linking up and sharing your post. I also appreciate your comment and visit. Happy Saturday, enjoy your weekend! Yup... birds with colour are returning. Red winged blackbirds are coming to my feeder. Oh I'm so glad. . . . .
Was just thinking about the El Mocambo on Bloor I believe...back in the day. did you go there too? I sight for sore eyes, I bet! They are such pretty little birds! I'll trade you some cardinals for a few goldfinches. Goldfinches are so incredible as harbingers of Spring! Beautiful shot, Pat. It's nice to see some colour and delivered to you by these lovely birds. Lovely to see the Gold Finches return. They do love thistle seed. Wonderful! Spring is definitely near. When they get their full color, I am always amazed by the depth of the yellow and how it contrasts so nicely with the black on the wings - almost could be a yellow tuxedo! Very nice they two !